These symposiums started as fossil turtles meetings and the first was the “I Simposium Internacional sobre Quelonios Fosiles”, held in the Institut de Páleontologie, Paris, France in 1983, and organized by France de Broin and Emiliano Jiménez-Fuentes. Twenty years later, in 2003, an international team led by Igor Danilov organized the second event, named “Symposium on Turtle Origins, Evolution and Systematics” and held in the Zoological Institute of the Russian Academy of Sciences, Saint Petersburg, Russia. At that time, the audience still consisted largely of paleontologists, but the focus was not limited to the fossil turtle community (see the proceedings of this meeting). In 2009, Donald Brinkman and collaborators organized the “Gaffney Turtle Symposium”, in honor of the American Museum of Natural History Emeritus Curator Eugene Gaffney. This symposium was held in the Royal Tyrrell Museum, Drumheller, Canada. As in the previous meeting, the audience was more extensive than just paleontologists (published contributions: Brinkman et al., 2013). Three years ago, in 2012, Walter Joyce, Joe Corsini, Ingmar Werneburg, and Márton Rabi organized the Symposium on Turtle Evolution, held in the Department of Geosciences of the University of Tübingen, Tübingen, Germany. The final contributions to this meeting are still in preparation and will constitute the first book exclusively about fossil turtles ever published, organized by Walter Joyce and relying on contributions from an international group of researchers from several institutions. Also in Tübingen, the venue of the next event – Rio de Janeiro, Brazil – was voted by the audience. Therefore, the fifth meeting redarding the evolution of turtles will finally be hosted in the South Hemisphere. Also, from now on, it is expected that researchers interested in turtle evolution will gather regularly every three years, continuing the tradition of organizing meetings and publications dedicated to the understanding of this fascinating vertebrate clade. 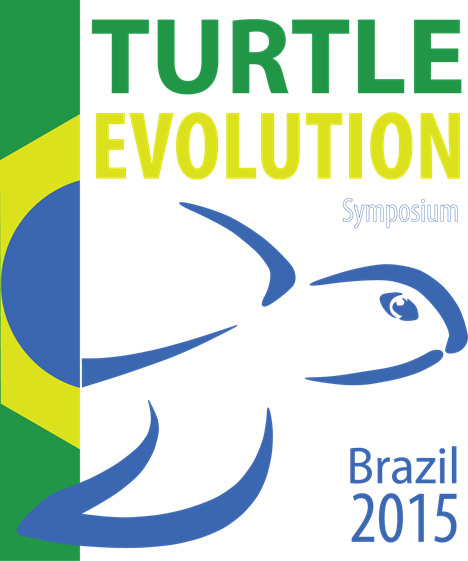 The 5th Turtle Evolution Symposium will feature 35 oral and poster presentations and will run from July 20th to 23rd, 2015. It will be organized into one poster session and six thematic sessions for oral presentations: “General aspects on turtle’s origins and evolution”, “Stem turtles, phylogeny, and biogeography”, “Side-necked turtle’s taxonomy and morphology”, “North American and European hide-necked turtles”, “Pelomedusoides phylogeny”, and “Asian hide-necked turtles”. Also, a special session about the “Perspectives on turtles’ taxonomy” will take place, followed by a round table discussion on this subject. So far, we have confirmed participants coming from 14 different countries: Argentina, Brazil, Canada, China, Colombia, England, Germany, Greece, Hungary, Japan, Poland, Russia, Switzerland, and USA, setting a broad group for discussion. At first glance, the Turtle Evolution Symposium seems to be restricted – considering that it is focused on a single vertebrate group. On the other hand, the variety of presentations reveal a wide range of research areas. The main focus is to understand how evolution works using turtles as a model. Based on this background, the presentations will address a variety of topics – for example the use of radiology and medical imaging tools, genomics, geometric morphometric, taxonomy, systematic, paleontology, molecular biology, zoology etc. Creating this PeerJ Collection is the best way to spread the contributions of this meeting and to get fast, broad-based feedback from a larger audience. Finally, I would like to take the opportunity to thank the PeerJ Editorial Team for the opportunity to work together and create this Collection. I would also like to invite all authors to publish their ‘complete papers’ that result from the presentations in Rio de Janeiro in PeerJ.